However, after 2 seasons of Is the order a rabbit? 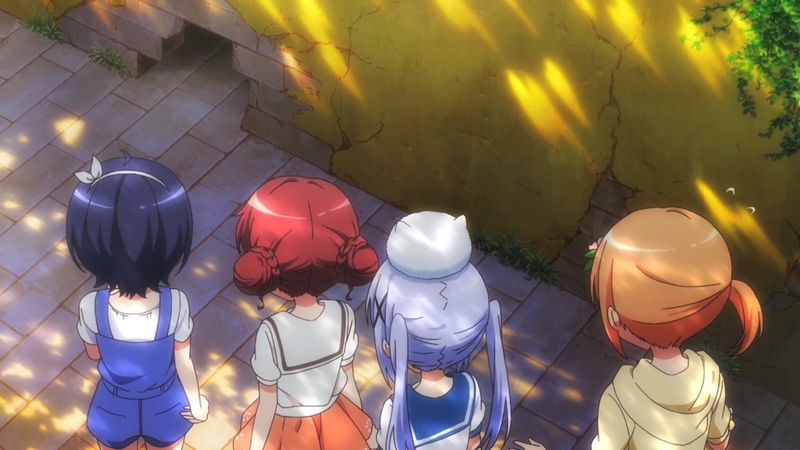 | Gochuumon wa Usagi Desu ka?, it has become apparent, that the show’s charms extends far from the norm: the endearing atmosphere and the intimate closeness of the viewers’ emotional investment with the characters onscreen, are the harvests grown from a well-soiled foundation of creative and thematic ideas that enrich such emotions of interconnectivity, similar to the communal sense of harmony felt by a well-knit village, where nothing ever goes wrong, has an abundance of cute wild rabbits but has no issues of desertification (probably a wrong use of terms, but you get the drift…rabbits ruin gardens), or the precious closeness between best friends, where the culprits includes a dead-pan loli who wears a rabbit on her head, whose body has her grandfather’s spirit trapped inside, and a genki girl who has a sister complex (and is dead proud of it). Ever since the debut of the hit series, Lucky Star, and the even bigger hit 2 years later, K-on!, the anime world has been engulfed in a surplus of such shows, where a group of cute girls laze around and engage in innocent activities, such as drinking tea, go on class trips and visiting spas. The simple premise of a plotless peek into the perfect lives of fictional characters has essentially established a new creative ground, where the rules of enjoyment are completely re-written. Instead of relying on the intense inner conflicts of a damaged main character, the political intrigues behind the intergalactic war’s frontlines and the bitter backstories of characters for enjoyment, as you trudge deeper into the pessimistically predicted dystopia, the slice of life genre offers you an alternate utopia, where no conflicts exist. A truly great realisation of such a concept is a show that can somehow retain one foot within comprehensible reality, but also offer an experience that enrich the audience with a warm blanket of optimism, and an inspiring alternative viewpoints on the curiosities and hidden wanders that IS normal life, on Planet Earth. Why invade Mars, when you can have a treasure hunt, right here in your own town? 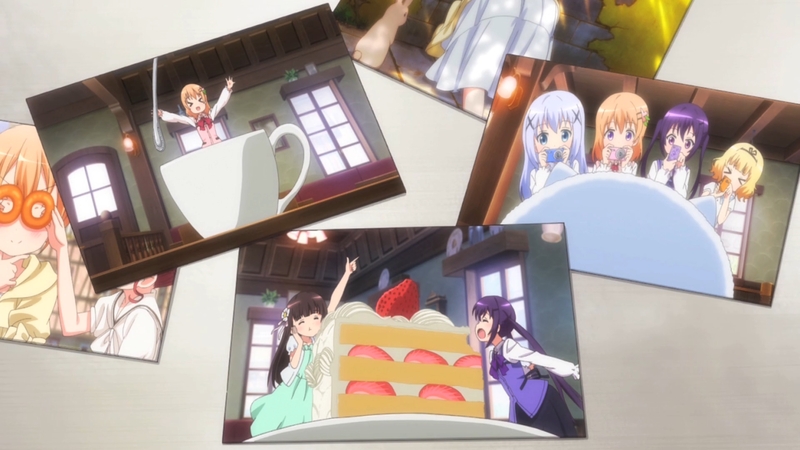 As a show with no arc-based or overarching plotlines, GochiUsa 2 consists of individual adventures embarked on by Cocoa, Chino and their friends, as they explore the streets of their town, enjoy the company of each other, whilst also learning to enrich themselves through the different personalities that exists within their group. What makes the entire experience irreplaceable, are the irreplaceably unique personalities of our main cast. Despite the inevitable fact, that each of them are moulded from the well-worn common tropes of anime characters, the personalities of our 5 main leads in particular, are polished to such an individualistic and interactive degree, that it’s utterly impossible to associate these characters’ voices, expressiveness and character ‘signatures’ with anyone else but them alone. In a combination of conservative but well-utilised character designs and a well-casted and scripted voice actors, the creators have invented a group of characters, that are individual people who are as unique as human beings themselves. Cocoa’s eternally happy, certainly, but her adorable charm stems from her ironically childish attempts to be grown-up and sisterly towards her juniors, resulting in the even more ironic fact, that Chino (though reluctantly at first), Maya and Megumi all admired Cocoa’s childishness and her effortless ability to inject fun into every situation or place they are in. Cocoa’s bubbly disposition and her addictive enthusiasm essentially provides the group dynamic with both a creatively comedic printing press, but also the heart of a child that always finds the best fun to be had. Other characters in the group: the gun-toting but self-conscious Rize, the bashful but criminally huggable Sharo and the mild-mannered but always scheming Chiya; all contribute admiringly to the main group, as each of them manages to inject a sense of multi-coloured diversity to the relational environment, which allows the show to be flexible in their depictions of character interactions. But in the centre of it all, Chino’s relationship with Cocoa is one of mutual misunderstanding, but eventual acceptance with a sense of affection that’s akin to the closest of sisters. 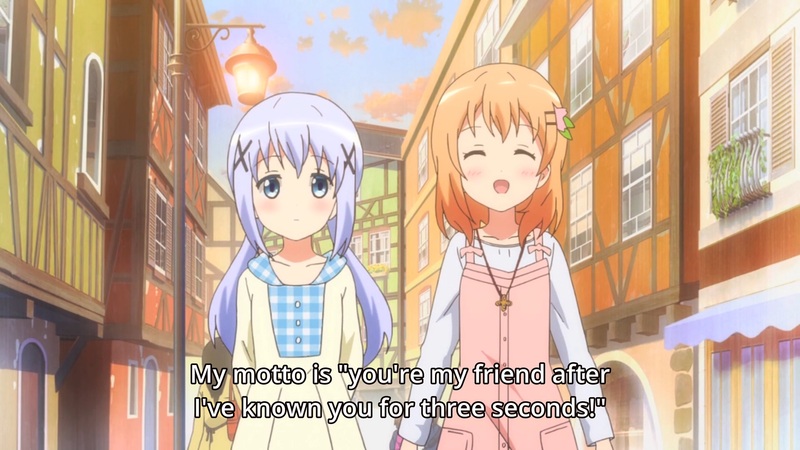 Expanding on the foundations of season 1, where Cocoa’s quirky, clumsy but honest attempts to make Chino accept her as an older sister has found its mark on Chino’s well-guarded heart, season 2 continues its thin but vivid thread of relational developments between these 2 girls. Cocoa’s genki personality and her ability to befriend everyone and everything, stems not only from her personal motto; one that’s optimistically admirable, but realistically suicidal; but also the viral nature of the lively energy that radiates from her presence, which the show depicts through both her actions and her friends’ realisations, in regards to the impact Cocoa has on their group dynamic: time and schedules seemed to have lost their relevance and photos started to descend into that pit of absurdity and goofiness. They dubbed it, the Cocoa Effect. 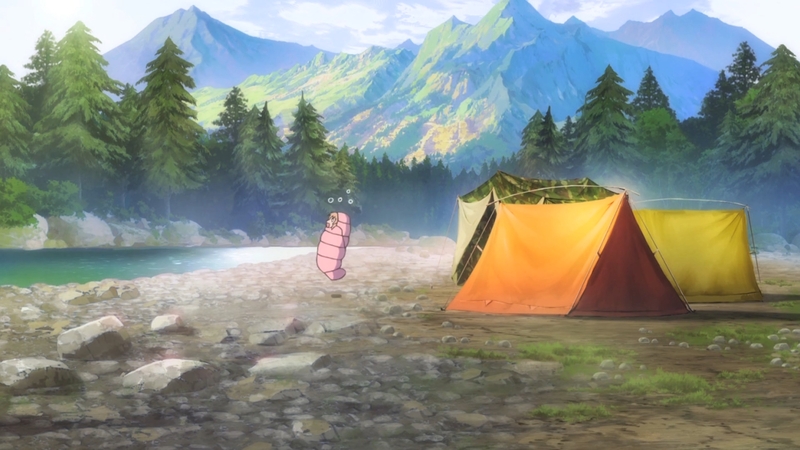 What made this ‘Cocoa Effect’ apparent are individual scenes throughout the season, but the episode 12’s ending notes to this wonderful ballad successfully conveyed the preciousness of these girls’ friendship and the central link that is Cocoa’s sense of fun. 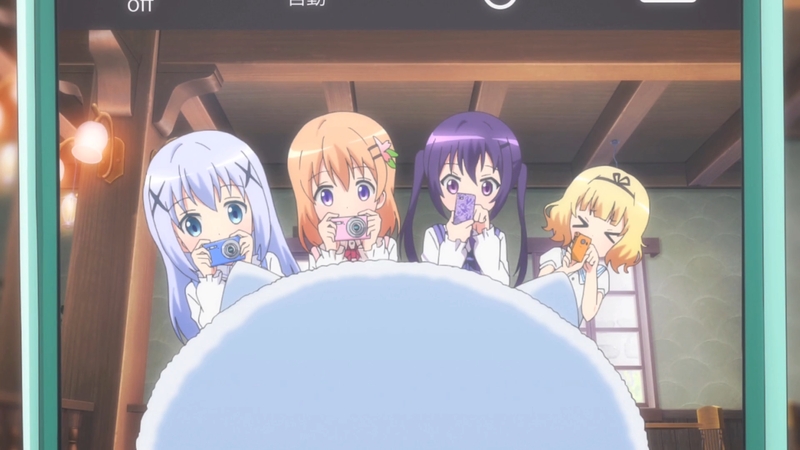 The opening venture of Chino’s attempt to capture the group ‘in their natural element’ was initially intended to be an album of incidental pictures of the girls working, conversing like normal human beings…but it didn’t take long, before Cocoa started a game of taking a picture of someone taking a picture of someone taking a picture of a rabbit above the portrait of a bodybuilder, and started having fun with camera framing and perspective tricks. The scene’s memorability stems from the individual gags that form a cohesive whole, as the show proceeds to solidify the character that IS this friend group. 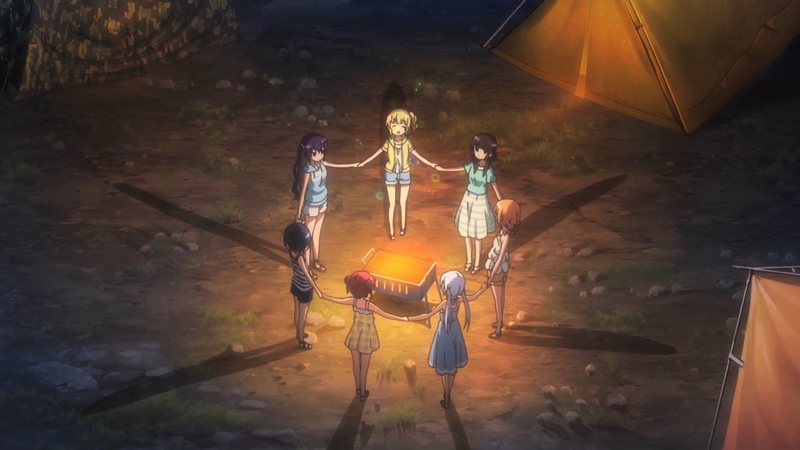 Also admirable, is the episode’s ability to inject an even more intimate sense of homeliness and nostalgic recognisability to the world of GochiUsa: the childhood memories of pretend-treasure hunts in the neighbourhood with nearby children are memories that are universally recognisable and closely etched into the most precious of childhood memories. The fact that all the characters within this group, who has lived in the town all their lives, remember their own rounds of treasure hunts with Ciste maps, adds an extra layer of communal interconnectivity to this town, as we are led to assume, that everyone in this community has experienced the same childhood. There’s even a sense of exclusivity and a rite of passage: being of a young age. 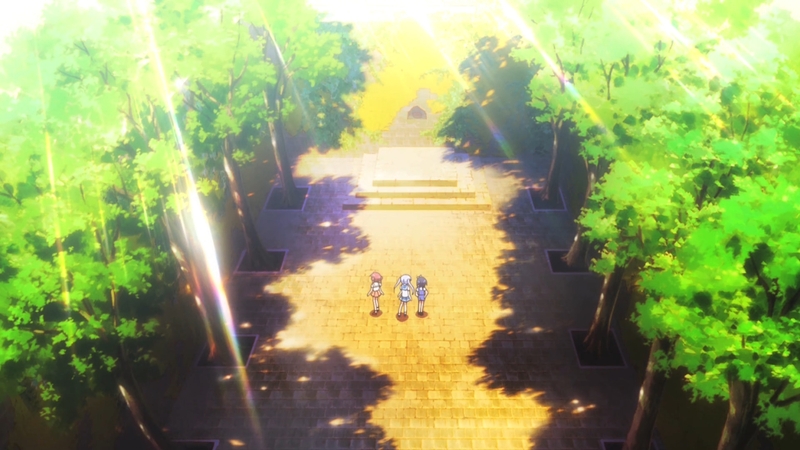 The chest found by Chino, Maya and Megumi was hidden beyond a child-sized hole in the stone wall, which hides a shrine-like platform, rightfully described by the trio as a place of sacred value, since Cocoa’s unfortunately grown-up state prevented her from completing the challenge. There’s almost a sense of mystical lore-like comradery in completing a Ciste map, whose significance is aided by the almost unwritten rules of the game: after finding a map lying around the town, drawn by the original initiators of the game, you use the map’s clues to find a treasure chest. 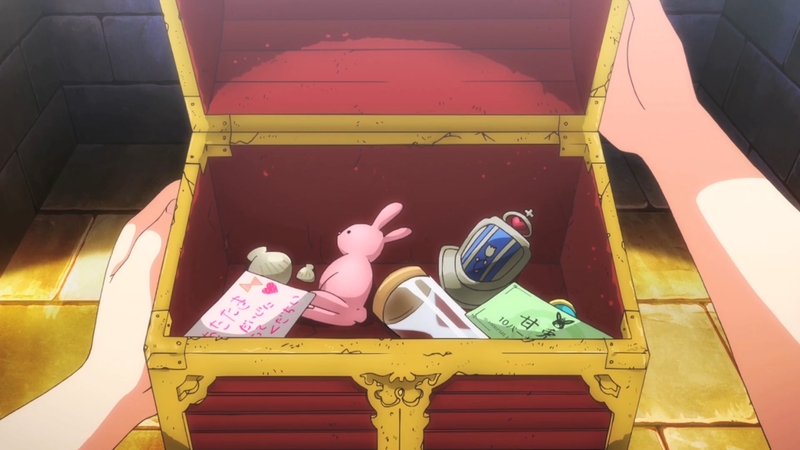 Your reward is whatever’s inside the chest, however, as a sense of honour, you exchange the contents with something that you own, before hiding the treasure map somewhere else. And thus, the game continues. Anyone getting Zelda vibes from this? Another observation from this game, also seems to suggest a lesson on the true value of treasures: the monetary value of the trio’s find are next to nothing, but completing the challenge as friends has given the group an irreplaceable memory. 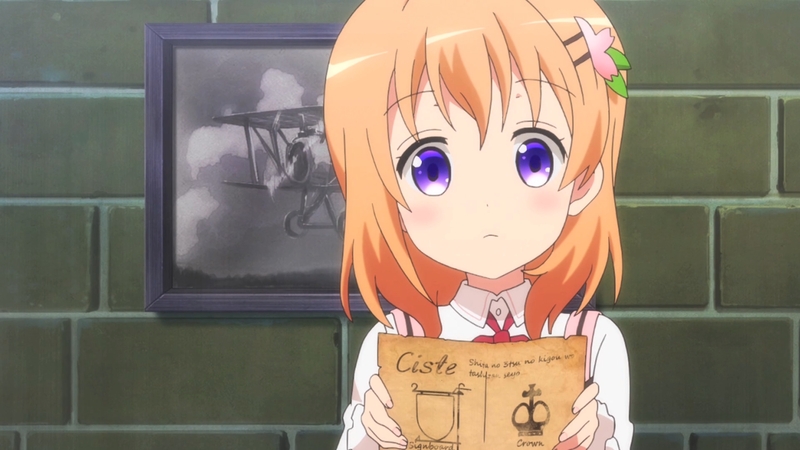 Naturally, the episode ends with Cocoa presented with another map, which inevitably embarks a girl; who moved to the town a year ago; on a new journey, with the chance to in a sense, gain her rite of passage to the town’s history of memories. And thus, another season of GochiUsa ends. There’s something special within this world of rabbits, and the rite of passage to indulge upon the endearing adventures of the girls is as simple as sitting back, and relax, as the show takes you on a journey of goofiness and bliss, etched with the tingle of childhood’s recalling. To conclude, Is the order a Rabbit?? is an heart-warming and small show, but wears its giant heart on its sleeve, and doesn’t pull its punches when it wants the audience to truly experience humans’ curious and wonderfully childish side.